AroarA's dusk set on the Bloor Ossington Folk Fest main stage was a festival highlight even though it was cut short by a sudden rain shower that sent the audience scattering from the grass and forced the sound techs to turn off the PA and pack up the stage early. 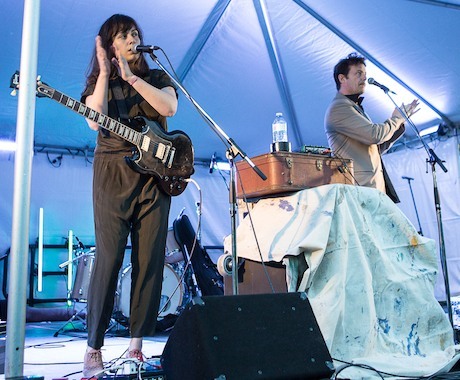 "We love music," said Ariel Engle, half of the lo-fi Montreal-based electro-folk duo along with her husband, Andrew Whiteman (Broken Social Scene, Apostle Of Hustle). "But we don't want to get electrocuted and you guys are getting really wet." If the duo's lyrics sounded poetic, it's because they actually were — Engle and Whiteman based their 2013 debut In The Pines on a book of poetry by Alice Notley about a woman undergoing treatment for Hepatitis C.
Heady stuff, but it worked surprisingly well in a folk fest context, with the pair's vocals playing off evocatively in incantation, highlighting salient bits of verse, for instance "closets on fire," "out on the periphery" and "in the pines" (they named all the songs after the numbers of the poems, so the quick, country rock tune with the lyric "never drive a stranger from your door" is called simply "2"). Like other duos before them, AroarA use electronics to fill out their sound, but it was charming live: their vintage-sounding drum machine parts had a kid somersaulting ecstatically in front of the stage. And they cleverly teased a wide spectrum of tones out of a couple electric guitars, including Engle's cigar box, with their parts harmonizing closely at times. Even the abrupt ending to the set served to make it stronger and more memorable.